For the last 40-odd years, Cuba’s ruling government has actively sought to eliminate the institutions that prevailed in Republican Cuba and to replace them with institutions that support a socialist, centrally-directed economy. The Cuban socialist regime undermined the institutions it inherited: eliminated private property, disassembled the legal framework that enabled private enterprise and decentralized economic decision making to operate, disabled the banking and credit system that supported economic activity, shackled the free press, and repressed civil society. That it has not fully succeeded in obliterating all of the Republican institutions is a tribute to the latter’s resilience and to the fact that institutional change is a process that takes time. Nevertheless, it is fair to say that sufficient change has occurred since 1959 that the architects of Cuba’s transition will be faced with a legacy of socialist institutions that will complicate creating the framework for a modern economic system in which enterprises and individuals can freely operate. Notwithstanding the governments’s efforts to make socialism a permanent feature of the Cuban nation,2 it is clear that significant changes will occur when Castro departs from the scene or even before then. When change toward a free market and multi-party democracy does occur, certain legacies of socialism will need to be overcome. Experiences of other former socialist countries have shown that it is indeed possible for successful transitions to occur, but for the most part transitions have turned out to be far more difficult, and to take longer, than reformers initially envisioned. Indeed, at the beginning of the 1990s, some optimistic reformers thought that the very act of removal of the ruling socialist party and its leadership and the dismantling of formal socialist institutions—primarily state ownership over the means of production and central planning—would be sufficient to start a process that would quickly result in free markets and multi-party democracies. This has not turned out to be the case. During the initial stages of the transition, the focus of Cuban policymakers is likely to be on macroeconomic stabilization and microeconomic restructuring. Once these processes are advanced, the construction of institutions that support the market can commence, among them a market-oriented legal system, a viable commercial banking sector and the appropriate regulatory infrastructure; labor market regulations; and creation or modification of institutions related to public unemployment and retirement systems. The record of a decade of reforms in the former socialist countries of Eastern and Central Europe indicates that the leading countries in terms of growth in gross domestic product (GDP) have been those that pursued a relatively complete set of reforms, including maintaining relatively clear property rights, a functioning legal framework and corporate governance rules (Svejnar 2002, p. 10). This paper deals with some of the legacies of socialism that will complicate Cuba’s transition. The set of issues examined is not exhaustive. Moreover, they are not discussed in this paper in order of priority or importance. They are: (1) a highly educated and low productivity labor force; (2) a small and deformed private sector; (3) high vulnerability to corruption; (4) unaffordable social services and pensions; and (5) lack of transparency. These challenges are by no means insurmountable, but presage a difficult transition for the Cuban nation. Despite the structural changes in the 1990s that promoted employment outside of the state sector (e.g., the liberalization of self-employment and the breakup of state farms and the creation of cooperatives), the state continues to be by far the largest employer in the nation. In 2001, the state employed 76.6 percent of all workers, a sizable drop from over 90 percent in the early 1980s, but still an overwhelming share of the nation’s workforce (Table 1). Human capital theory posits that education enhances worker productivity and thus leads to higher wages. In socialist Cuba, however, educational achievement bears little correlation with labor productivity or with wages. One of the many paradoxes of today’s Cuba is a nation with a very highly educated work force with abysmally low worker productivity. In fact, Cuba may have one of the most highly educated tourism sector workforces in the world—trained physicians, lawyers and technicians leave jobs in the profession for which they were trained and take instead low-skill jobs as taxi drivers or tour guides because these occupations carry the possibility of earning tips or payments in dollars or other freely convertible currencies. Underemployment became an even more serious problem in the 1990s under the explicit government policy of preserving state sector jobs despite extensive plant closings and work interruptions brought about by the economic crisis and the associated shortages of raw materials and spare parts. According to CEPAL (1997, p. 187), Cuba’s open unemployment rate hovered in the 6-7 percent rate in 1990-96, while “equivalent unemployment”3—an estimate of underemployment—climbed as high as 35.2 percent in 1993. Combining open unemployment and underemployment, over 40 percent of the labor force was not fully productively employed in 1993. In 1996, the most recent year for which the open unemployment rate (6.8 percent) and CEPAL’s estimated equivalent unemployment (27.3 percent)4 are available, over one-third of workers (34.1 percent) were not fully productively employed. There are no systematic and reliable time series on labor productivity in socialist Cuba. This results in part from problems with the methodology used by Cuba to calculate its national income and product during the first three decades of socialist rule.5 Fragmentary information suggests that despite national campaigns and exhortations by the official workers organization, the government-controlled Central de Trabajadores de Cuba (Cuban Workers Central, CTC), labor productivity has been very low. Based on fragmentary information, Mesa-Lago (2000, p. 260) concludes that average labor productivity growth rate during the period 1971-85— arguably the period of strongest economic growth by socialist Cuba—was low and well below planned targets; in fact, Mesa-Lago argues that if the exceptionally high economic growth rate of 1981 is excluded,6 average labor productivity growth for the entire period 1971-85 was actually negative. Low productivity growth during this period is consistent with other information on underutilization of labor across several sectors of the economy (Mesa-Lago 2000, p. 260). For the second half of the 1980s, average labor productivity declined at an annual average rate of 2.6 percent, compared to a planned annual increase of 3.5 percent per annum (Mesa-Lago 2000, p. 286). There are no official statistics on labor productivity in the 1990s but the CEPAL estimates mentioned above suggest that it declined severely in this period. Although there are many reasons for Cuba’s low and declining labor productivity—among them the abominable state of the capital stock and the lack of steady supplies of raw materials—it is clear that absenteeism and labor indiscipline are also important factors. The full employment policy that guarantees a job regardless of work effort, the meager wages that workers receive, and the generous health and education services that are available to the population at large, breed limited on-the-job effort. The popular saying attributed to Soviet workers—“We pretend to work and they pretend to pay us”—is applicable to Cuban workers as well. Table 2 reproduces official data on average monthly salaries of workers in state enterprises and joint ventures during the period 1995-2001. The average monthly salary rose from 202 pesos to 245 pesos, or by 21.3 percent, over this period. These statistics refer to salaries in current pesos, however, and therefore they do not reflect purchasing power since they are not adjusted for inflation. Cuba does not publish statistics on inflation, but based on official household consumption statistics a rough estimate can be made that inflation during 1996-2001 was 19.9 percent, so that the purchasing power of the salaries earned by Cuban workers in 2001 was actually virtually unchanged from 1996 (21.3 percent rise in money wages compared to 19.9 percent inflation).7 Add to this the fact that many of the basic household consumer products are not available in peso-denominated stores and must be purchased in dollar-denominated outlets, at prices that approximate those in world markets. Considering that the peso to dollar exchange rate recently has hovered around 25 pesos for one U.S. dollar, in 2001 the 245 pesos per month average salary of a Cuban worker was equivalent to under 10 U.S. dollars per month. The severe shortage of consumer goods that the Cuban population has endured during the special period and the possibility of being able to obtain such goods from dollar stores means that time away from a job that pays in pesos to engage in wheeling and dealing to earn dollars is preferable as a family survival strategy than going to work in a job that pays in pesos or working overtime for pesos. This explains in part the lack of on-the-job effort and the poor work habits of the workforce, particularly in state-owned enterprises. During the transition, workers will expect that the purchasing power of their salaries will rise and they would at last be able to enjoy levels of consumption similar to those enjoyed by workers in other free market countries. Educated workers will have high expectations of material reward. Particularly those workers who have endured the socialist system longer will show little patience with a system that does not reward them immediately. The lessons from Central and Eastern Europe in this regard are not encouraging for a Cuban transition: “Decades of stifling bureaucracy, incessant propaganda, and an extreme nanny state destroyed people’s will to work. Entitlements became a way of life. No one expected to get fired, and the government was viewed as the solution to all problems. As a result, most people over the age of 40 were lost, and it will be left to the youth to forge a future” (Aslund and Hewko 2002). Although the state owns most of the factors of production, it has not been able to eradicate entrepreneurship in Cuba. The booming black market of the 1990s, and the enthusiasm with which the population initially accepted the liberalization of self-employment in 1993, suggest that the Cuban population has unbounded ingenuity and is capable of making ends meet under very unfavorable economic conditions. The ability to function effectively within a particular set of market institutions comes about as a result of market activity rather than being endowed or learned quickly through formal education. Therefore the lack of market institutions under communism leads to a dearth of both market-oriented human skills and organizations that can function in the market environment. Moreover, the market experiences of most individuals have been with largely unsophisticated market institutions, often with those of the black market. The market skills that do exist are ones geared to markets with simple institutional prerequisites rather than those fit for the types of markets in which large organizations would prosper. Cuba’s private sector is very small. According to official statistics (Table 1), total private domestic employment in 2001 amounted to 584,800 workers, or 14.7 percent of total employment. Reportedly, the majority of these private sector workers are small agricultural operators. Self-employed workers accounted for about 26 percent of private sector employment in 2001. It is interesting to note that when self-employment was liberalized in the summer of 1993, there was a strong response in the form of a rush of workers to register as self-employed. By December 1993, only a few months after the new self-employment regime had been in place, 70,000 persons had gone through the necessary steps to be registered as self-employed workers; by the end of 1995, approximately 208,000 workers had registered (Jatar-Hausmann 1999, p. 97). Since then, the number of registered self-employed workers has fallen off as the government increased fees and taxes, issued more restrictive regulations, and stepped up oversight, reducing the space that these private workers needed to operate. According to Table 1, the number of selfemployed workers in 2001 was about 152,300. Cuba has no wholesale distributors. The Cuban government has not opened supply markets. Intermediaries are not only illegal, but unwanted. … When Jorge [a self-employed shoe maker] is asked about where he has been buying the little equipment he uses to work, he answers coyly, “little by little I have been collecting it,” but his smile seems to say “Why are you asking such a dumb question?” And it is, in fact, a silly question. Everybody knows that there are no free markets for any of the instruments used by Jorge; nor are there supplies for most of the products the artisans make. They either take them from their workplaces (in other words, steal them) or they buy them in the black market. Where do the products in the black market come from? From other workers who do the same thing. Everyone has to steal in Cuba for survival. The existence of a private sector in some former socialist countries has been a positive factor in their transitions. For example, Poland and Hungary, two socialist countries that for historical reasons had well established private sectors prior to the transition (recall that Poland’s agricultural sector remained largely outside of state control and reforms in Hungary that began in the 1960s promoted limited consumerism and market forces earned that country’s system the label of “Goulash Socialism”) saw the existing private sector as the basis for the expansion and multiplication of private enterprises once the shackles of the socialist system were removed. The experiences of Poland and Hungary suggest that where there is an existing private sector, it is relatively easy to create conditions that allow entrepreneurs who have created small businesses to expand their activities and multiply, creating new businesses and generating employment opportunities. Barely two years after the transition in Poland, retail trade was almost completely in private hands, as was 55 percent of the construction industry and 24 percent of transportation services. By the end of 1992, 56 percent of the labor force worked in the private sector, generating almost half of the country’s gross national product (Nagorski 1993, p. 175). In Hungary, there was an explosion in the creation of small businesses immediately after the transition. The number of enterprises grew six-fold between 1989 and March 1992, from 10,811 units to 58,951 units. Nearly all of the new enterprises created were small companies. While in 1989, 53 percent of Hungarian enterprises employed more than 50 workers, by 1990 that share had fallen to 36 percent, with about one half of the latter employing fewer than 20 workers. The major sources of the emerging class of new private entrepreneurs in Hungary were reportedly the state sector (it was customary in Hungary for state workers to hold legal secondary jobs), small businesses, industrial or agricultural cooperatives, and operators of agricultural household plots (Kiss 1992, pp. 1027-1028). • The overwhelming size of the public sector means that the state employs an inordinately large number of workers. Therefore the potential for corruption is very large. • Central planning of thousands or even millions of production enterprises, and an even larger number of retail outlets and individual products and services requires a huge bureaucratic apparatus. At every turn, production and distribution decisions are regulated by inflexible plans and allocation procedures; enterprise managers often have little choice but to use illicit influence to get around planning strictures to obtain labor or raw materials. • The ruling party itself is often the locus of corruption, as the top leadership is normally immune to exposés and reprisals from below, and can engage in self-serving behavior. The ruling class or political elite has been referred to as the “new class” (Djilas 1957) or the nomenklatura (e.g., Voslensky 1984). It was typically able to draw on the resources of the state and to treat socialist property as its own: salary supplements, the best housing; special food allocations; access to restaurants, stores and other facilities; vacation country villas or dachas. It also participated heavily in the system of taking bribes in return for doing favors such as appointing persons to prestigious posts, protection, promoting people up the bureaucratic ladder, and using influence to stop the government from taking actions. • The Cuban state’s overwhelming control over the economy translates into black markets in nearly all areas of economic activity. Thus, not only are there black markets for food and consumer goods—goods ostensibly covered by the rationing system—but also for construction materials for home repairs and spare parts for appliances and motor vehicles. Misappropriation of government resources (via theft, diversion of goods, short-changing of customers) has traditionally been one of the main sources of goods entering black markets. • The extremely high concentration of resources in the state, and the centralized nature of decision making, place a great deal of power in the hands of government officials and hence create ample opportunities for corruption. In addition to corrupt behavior in return for bribes, corruption in socialist Cuba takes the form of using power to obtain access to other things, degenerating into a generalized “I’ll scratch your back if you‘ll scratch mine” system that rewards those who are friendly with government officials and is referred to as sociolismo, a take-off on socio (buddy) and socialismo. • A new and troubling form of corruption is what has been called in other socialist countries “spontaneous privatization.” This refers to the appropriation of state property by members of the nomenklatura through the paper reorganization of state-owned enterprises into “private” corporations of which the nomenklatura members are owners or directors. This activity “is the very essence of corruption, being the outright theft of public assets by politicians and/or enterprise directors associated with the nomenklatura” (Kaufmann and Siegelbaum 1997, p. 439). 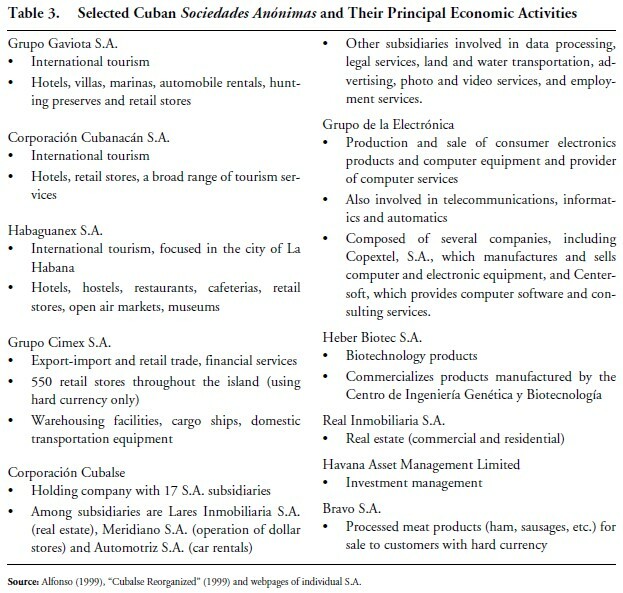 By the end of 1992, reportedly 63 of these privatized entities, called sociedades anónimas or just S.A. were operating in Cuba, and many others have been created since then (see Table 3 for information on selected Cuban S.A.). The “owners” of these corporations have not purchased their assets from the state nor have they contributed intellectual property, invested any savings or incurred any risks. Instead they are individuals loyal to the Cuban government who have been given control over state assets illegally in a manner reminiscent of the systemic theft of private property in Nicaragua by the Sandinista regime in Nicaragua known as la piñata. The S.A. tend to operate in the more dynamic sectors of the economy that generate hard currency and are capable of attracting foreign investment: tourism, electronics and telecommunications, biotechnology, commercial real estate, financial services. As Naím (1995, p. 251) points out, a corollary to Klitgaard’s stylized corruption equation is that the deepening of democratization should have corruption- curbing effects. Why, then, is there a perception that corruption has been rampant in countries transitioning from authoritarian, centrally-planned regimes to democratic, market economies? One explanation for this phenomenon is that in the absence of strong institutions, democracy and free markets provide more—and more visible— opportunities for corruption than under authoritarian rule. Under the latter, corruption can be more institutionalized, controlled and predictable. Naím argues that a well organized dictatorship can provide “one-stop” shopping for corruption services, where the right amount of money given to the right official will take care of all needed interventions. Under this system, bribe takers under the control of an authority (either the authoritarian leader or a political party) collude and keep their actions out of the public’s view. Under a democratic system, in contrast, the central government’s control over the providers of bribery services is diluted and corrupt officials compete for bribes, resulting in a process that is more visible to the public than under authoritarianism. Corruption in these emerging markets is doubly pernicious. First, it compromises the efficacy and efficiency of economic activity, making the transition to free market democracy more difficult. Second, and equally important, corruption distorts public perceptions of how—and how well—a proper market economy works. Under such circumstances it becomes all too easy for economically beleaguered publics to confuse democratization with the corruption and criminalization of the economy—creating fertile soil for an authoritarian backlash and engendering potentially hostile international behavior by these states in turn. It is probably fair to argue, however, that democratic regimes, over the long run, engender more powerful antibodies against corruption than authoritarian systems under which political liberties are stifled (Glynn et al 1997, p. 11). Cuba has had a long history of providing social services and pensions to its citizenry. A public elementary school system was in place since the early days of the Republic as was also a system of public health services. Although there were serious differentials in availability of social services between rural and urban areas, Republican Cuba performed quite well in comparison with other countries in the region.9 In 1957-58, Cuba’s performance in providing education, sanitation, health care, and social security to its citizens was among the three highest in Latin America, but social service facilities were concentrated in La Habana and in urban areas, and availability and quality of services dropped off significantly in rural areas (Mesa-Lago 2000, p. 172). Cuba introduced a pension scheme in the 1920s, one of the first countries to do so, and pensions expanded significantly in the following decades. Before the 1959 revolution, Cuba had one of the most developed pension systems among countries with a similar level of income. However, the pension system was fragmented in more than 50 autonomous programs that covered certain groups of workers in urban areas and were subject to their own regulations and financing. An estimated 55 to 63 percent of the population was covered by the pension systems although not the poorest segments of the population such as rural workers, the self-employed, domestic servants and the unemployed (Pérez 1998, pp. 520-521). After the 1959 revolution, the Cuban government undertook a deliberate policy of expanding social services and reducing urban-rural differentials in the delivery of such services. Private schools, hospitals and other health facilities were nationalized and taken over by the state. In 1961, the Cuban government launched a national campaign to eradicate illiteracy and began a drive to build schools and educational facilities in rural areas. By 1962, the Cuban government had unified the different pension programs and in 1963 a new law broadened the coverage of the pension system to all of the salaried workforce and made the financing of the system the direct responsibility of the state. In the 1970s and 1980s, the Cuban government devoted a large share of the nation’s resources to creating an infrastructure to provide social services to the population and expanded the delivery of such services. These investments resulted in dramatic improvements in social indicators such as: increase in literary and in school enrollment; increase in life expectancy; decline in infant mortality; and increase in the availability of physicians, dentists and hospital beds. At the same time, the coverage of the pension system was expanded to agricultural cooperative members and retirement requirements eased (the retirement age was lowered to 60 years of age for men and 55 years of age for women), contributing to a tremendous increase in the number of pensioners. The ratio of active workers per pensioner, which was 14.7 in 1958, dropped to 7.2 in 1970, 5.2 in 1979 and 4.2 in 1990 (Mesa-Lago 2000, p. 396). As social services and pensions expanded, so did the cost to the state of providing them. Government expenditures on social services (education and health; social security, welfare and culture; and housing and community services) ranged from 33 to 36 percent of the national budget in the 1960s and 1970s. It climbed to 41 percent in 1982 and remained at above 40 percent for the 1980s, peaking at nearly 46 percent in 1988 (Mesa-Lago 2000, pp. 352-353). Arguably, Cuba could afford this very extensive safety net because of the huge financial assistance it received from the former Soviet Union. • The real average pension declined by 48 percent in 1989-98; and • The average pension in 2000 of 104 pesos per month was equivalent to 5 U.S. dollars. The cost of social security (pensions, health care and social assistance) has been climbing as a result of several factors: nearly universal coverage, very low retirement ages, the maturity of the pension scheme, and the aging of the population.10 Social security expenditures as a percent of GDP rose from 10 percent in 1989 to 13 percent 1999-2000 and is expected to continue to rise in the future. The state is covering the expanding deficit of the pension system out of current revenues (Mesa-Lago 2001, p. 10). To complicate matters for the architects of a Cuban transition, when asked, Cubans opine that while they want to change their current system of government and have freedom, democracy, and free markets, they want to keep the achievements (logros) of the revolution in the social services area. • 55 percent favored retaining some of the policies of the revolution after the transition to a democratic, free market Cuba. In fact, 90 percent of the respondents who had a favorable reaction to the educational system favored its continuation beyond the transition. On health services, while 98 percent of the respondents thought that a free market would lead to better quality health care, 71 percent felt that the free health care should be maintained. How to reconcile the reality of an unaffordable social services system with the desire of the population to continue to receive the free social services they have grown accustomed to receiving? Developing a national consensus on a reasonable, affordable level of social services targeted at those that need them the most and identifying ways for those who can afford to pay for their own in the marketplace will be a major challenge of the government of a Cuba in transition. Nobel Laureate Joseph Stiglitz, in the Oxford Amnesty Lecture he delivered in 1999, argued that “there is, in democratic societies, a basic right to know, to be informed about what the government is doing and why.” He further argued that there should be a strong presumption in favor of transparency and openness in government. Secrecy gives those in government exclusive control over certain areas of knowledge, and thereby increases their power, making it more difficult for even a free press to check that power. In short, Stiglitz argued, a free press is necessary for a democratic society to work effectively; without access to information, a democratic society’s ability to perform its central role is gutted (Stiglitz 1999). Transparency, openness, the right to know, free speech and a free press provide checks on the power of the government and prevent it from abusing power. Secrecy, their antithesis, shelters bad government, misallocation of resources, illegal behavior and corruption. Amartya Sen, also a Nobel Laureate, has observed that famines do not occur in societies in which there is a free press—it is not the lack of food that gives rise to famines, but the lack of access to food by the poor in famine-stricken regions. A free press exposes these problems; once exposed, the failure to act is absolutely intolerable (Stiglitz 1999). Socialist societies are notorious for their secrecy and for the lack of accountability of their leaders and governments. The population in socialist societies is subservient to the Communist Party and the government. Since there are no free elections, whatever legislative bodies might exist are merely instruments of the leadership. Government decisions are made behind closed doors. There is no public right to know. The press, and more broadly all forms of media, express the official views of the state in their reporting and editorial opinions. Civil society is very weak: the main mass organizations are controlled by the state and independent civil society institutions are rare and those that exist have very little space to operate. All Cuban mass media are owned and operated by the Cuban government, the Cuban Communist Party, or affiliated organizations. The Cuban government took over most newspaper and broadcast stations in 1959. In February 1961, only six daily newspapers were being published in La Habana compared to 16 in 1959. After 1963, Granma, the organ of the Central Committee of the Cuban Communist Party patterned after the Soviet Union’s Pravda, became the only newspaper in the country. Other government- operated newspapers were created in the 1970s and 1980s to address special groups (workers, farmers, youth, military personnel) or geographic areas; most of these were shut down or their frequency of publication scaled back during the 1990s as a result of shortages of newsprint. The government also owns and operates all broadcast stations. According to the international organization Reporters Without Borders (2002), the Cuban media “is subtly and effectively repressed so as to maintain the state’s monopoly over information.” A U.S. journalist who visited the island in 2002 said about his Cuban counterparts: “These are not journalists. … These are government public relations agents. … Regardless of how they try to spin it, they work for the state-owned media—TV, radio and newspapers—and they spew the official line of Fidel Castro” (Curry 2002). In mid-March 2003, the Cuban government cracked down on nonviolent dissidents, independent journalists, human rights advocates, independent librarians and other dissidents, arresting dozens of people, searching their homes, and, in many cases, confiscating fax machines, computers, books, typewriters and personal papers. They were accused of working with U.S. diplomats to undermine the Cuban government and damage the country’s national interests. In April, 75 the defendants were tried using “facilitated” procedures and sentenced to jail terms ranging from 6 to 28 years of imprisonment, with an average sentence of more than 19 years (“Crackdown” 2003). Clearly, the crackdown dealt a severe blow to independent journalism within the island. Finally, the Cuban state does not permit—more accurately, it actively prevents—the creation and operation of independent organizations. Although the Associations Law (Ley de Asociaciones) purportedly guarantees the right of Cuban citizens to associate freely and form independent associations, in practice, the law effectively bars the legalization of genuinely independent organization. The law requires organizations to “coordinate” and “collaborate” with a state counterpart entity. Fulfilling this condition necessitates the group’s subjugation to the government organization, by allowing a representative of the state entity to attend and speak at any planned or unplanned meetings; requiring the group to notify the government entity in advance of any publications; coordinating with the government entity regarding participation in any national or international event; regularly reporting to the government entity on its activities; and providing prior notice of the date and hour of any meetings or any other activities (Human Rights Watch 1999). The Cuban state uses the registration process to thwart the creation of independent organizations. Only those organizations that are authorized by the state can operate legally. However, the state encourages citizen participation in officially-sanctioned mass organizations such as the Committees for the Defense of the Revolution (CDR), the Federation of Cuban Women (FMC), the Cuban Workers Central (CTC) and the Union of Communist Youth (UJC).12 Participation in these organizations or their activities should not be equated either with individual or group autonomy or with genuine mass spontaneity. Participation …. means discussing local affairs, doing volunteer work, receiving “guidance” from party officials, marching in the street against fellow citizens who choose to emigrate, attending mass rallies, and engaging in other revolutionary duties (del Aguila 1988, p. 181). In contrast with the organizations sanctioned by the state, there are myriad truly independent civic organizations seeking recognition to be able to operate legally in the island. Common threads running through these organizations are that they are very small, command very few resources and operate illegally since they have not sought the required registration from the state or, if they have sought such registration, have not received it. Thus, members risk the possibility of being harassed, fined, arrested, or imprisoned at any time for breaking the law, and many were in the March 2003 crackdown on dissidents. The fact that these organizations are illegal also hinders their ability to receive resources from abroad. Over the last four decades, Cuba has made remarkable strides in adopting the key institutions and practices that characterized socialist societies. Cuba’s diligence in becoming a socialist nation, eagerness in embracing socialist institutions, and rigidity in applying orthodox socialist policies and practices, do not augur well for an easy transition in the island. Transition planners would do well to recognize the many legacies of Cuban socialism so that they can counteract them effectively in the transition policies they design. Emigrés and foreign advisers arriving with a can-do swagger and the confidence that they “know it all” often failed to understand how society functioned. Under communism people may have forgotten how to work and never learned to use a credit card, but they were bright and had pride. The combination of local pride and emigré arrogance excluded all but a handful of emigrés from prominent government positions. Without genuine humility, returning emigrés are not likely to succeed. An awareness of these problems helps to harness them. Let us hope that the architects of the Cuban transition consider explicitly the legacies of socialism as they design long-term strategies that lead to freedom, democracy and prosperity for the Cuban people. 1. This paper expresses only the personal views of the author. It is a revised version of a paper prepared for the Rand Corporation, July 2002. 2. The reference is to the campaign launched by Fidel Castro in June 2002 to reform the Cuban Constitution to declare the “irrevocable” nature of its socialist political and social system. 3. CEPAL (1997, p. 165) estimates “equivalent unemployment” for a given year with reference to 1989 as the product of the underutilization of the labor force (i.e., the gap between average productivity in a given year compared to 1989) times the labor for the given year. 4. Although CEPAL updated its study of the Cuban economy through the end of the 1990s (CEPAL 2000), it did not update the “equivalent unemployment” estimates, which end with 1996. 5. At least through 1990-91, socialist Cuba based its national income and product accounts on the Material Product System (MPS), the system used by the Soviet Union and other socialist countries. Nearly all other countries (developed and developing) used the System of National Accounts (SNA). There are numerous differences in the two systems, but perhaps the most significant is that the MPS excludes the contribution of “nonmaterial services” (e.g., social services, national defense, education, government administration) but includes the value of intermediate outputs (i.e., it is affected by double counting of some outputs). For a fuller discussion of these methodological differences, see Mesa-Lago and Pérez-López (1985). Around 1990-91, Cuba seems to have abandoned the MPS and adopted the SNA. 6. Mesa-Lago suspects that the exceptionally high growth rate for 1981—a growth of 16 percent in the global social product— overstates actual performance in that year and may have been the result of a change in the price base for the series and other methodological changes. See Mesa-Lago (2000, p. 251). 7. According to official statistics (ONE 2002, p. 89), between 1996 and 2001 household consumption at current prices rose by 35.8 percent while consumption at constant prices did the same by 15.9 percent. It follows, then, that prices of articles consumed by households rose by 19.9 percent during this period. 8. See Clark (1990 and 1999) for a thorough treatment of this subject, including through surveys of emigrés. 9. See Smith and Llorens (1998) for international comparisons of socioeconomic indicators for pre-socialist Cuba. 10. It is estimated that by 2025, Cuba will have the oldest population of the region and there will be two persons of productive age for every person of retirement age (Mesa-Lago 2001, p. 10). 11. Among other press outlets in the United States, El Nuevo Herald often carries news reports filed by independent journalists residing in the island. 12. In fact, the Cuban Socialist Constitution of 1976 in its Article 7 stated that: “The Cuban socialist state recognizes, protects and supports social mass organizations, such as the Cuban Workers Central, which includes in its ranks the fundamental class of our society, the Committees for the Defense of the Revolution, the Federation of Cuban Women, the National Association of Small Farmers, the Federation of University Students, the Federation of Mid-Level Students, and the Union of Cuban Pioneers, as well as others that originated from the historical class struggle process of our people and that represent specific interests of our citizens and incorporate them in the tasks of building, consolidating and defending socialist society.” The revisions to the Constitution in 1992 maintained the same article, but dropped the listing of the specific mass organizations.